This is a blog update for my original post back in January of 2013 to which I have modified the pattern slightly to give a symmetrical border to the washcloths as well as to account for the weight (thickness of yarn) difference from Bernat’s Handi-Crafter cotton to KnitPick’s Dishie. 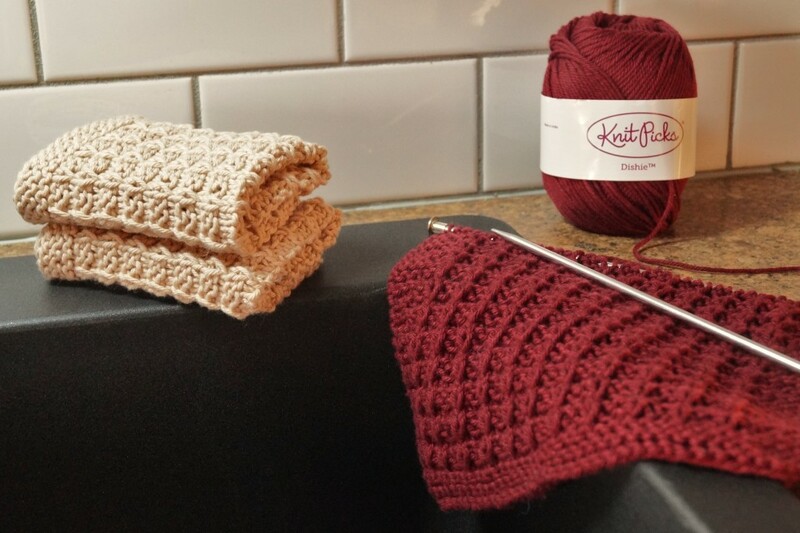 With KP Dishie being slightly thinner, I have added extra stitches and pattern rows to get the same size washcloth as when knitted with Bernat’s yarn. A quick, easy to memorize pattern transforms cotton yarn into brightly coloured squares worthy of anyone’s cocina. Gauge: It isn’t important with this project. Cast on 38 Stitches using the Thumb Method (sometimes called ‘e-loop’ method) or the Long-Tail Method, either of these give a nice, stretchy cast on edge. Perfect for beginners, it is very easy to do and you only need one needle to do it. These four rows make one pattern set. Work 14 pattern sets for each dishcloth. Bind off stitches loosely and weave in ends. Cast on 41 Stitches using the Thumb Method (sometimes called ‘e-loop’ method) or the Long-Tail Method, either of these give a nice, stretchy cast on edge. Perfect for beginners, it is very easy to do and you only need one needle to do it. *Note; if using the Long tail cast on method, once you cast on, Knit 5 rows (garter stitch), THEN proceed to pattern below. These four rows make one pattern set. Work 15 pattern sets for each dishcloth. Be creative in your colour choices, as here is an opportunity to make a bold colour statement in your kitchen without using paint. Bright pops of colour are mandatory in my kitchen. On the plus side, if you have bits and bobs of leftover cotton yarn, use them up for additional washcloths that can be delegated to laundry room duty. Heck, use them in the kitchen or bathroom, no matter the colours as long as they work, and work hard they will. 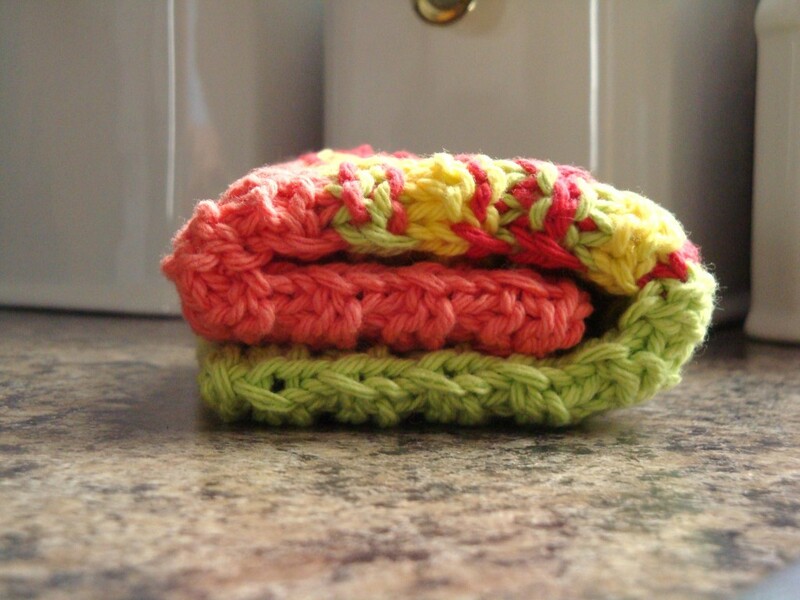 This entry was posted in For the Home, Kitchen, Knitting by Deborah. Bookmark the permalink. I love this pattern especially with the bright colors. I’ve just started working on it and have a question for you. Should 39 sititches be cast on instead of 38? That would leave 33 stitches for the 3 stitch rep on rows 3 and 4. Thanks for you help. Hi Cheryl ~ cast on 38 stitches only, row one is Knit, row two is K3, purl to last 3 stitches, K3, then do your patterned rows for 3 and 4. The 3 pattern repeat is based on P2, Slip One, but when you get to the last 5 stitches, there is just a P2 left before the K3 for the border, just like at the beginning….hence the 38 stitches…. hope this helps and I hope you enjoy them! I just finished making 4 the past couple days.